Update: Another Total War: Warhammer trailer has appeared, this one focused on the layout and peoples of the world itself. Well, this is embarrassing. Just as I post one Warhammer video, another one pops up. They’re like buses you can’t ride but are far more interesting to look at. The Old World trailer, as it’s titled, shows off the world of Warhammer (that sounds familiar…) to those that may not be aware of its layout. Considering previous games have been based in, you know, the real world, probably a smart play from Creative Assembly. We’d really quite like it if Total War: Warhammer made it onto our best strategy games list. It also outlines the factions, and gives us a glimpse of universe big-bad Archaon Everchosen. 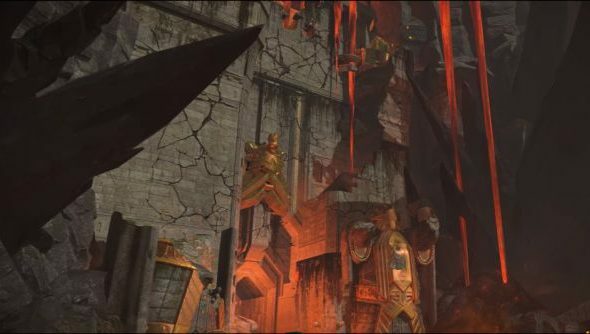 When he’s not glaring in trailers, Archaon likes to ride around on three-headed Chaos chimerasand literally end the world. He was the catalyst and focus for the End Times, Warhammer’s semi-recent reboot of its universe. He marched out of the northern wastes, killed basically everybody, then wrestled with, if I remember right, a manifestation of God as the world collapsed into nothingness around them. So that’s what playing Chaos will be like, I suppose. Kinda rad, really. See below for the other video from earlier today, with an in-game battle between the Empire and a massive force of zombies. Original story:Pre-empting the inevitable instincts of their players, the Total War: Warhammer community team has started experimenting with gimmick battle videos. This first one pits a legion of zombies and their necromantic overseer versus nothing but Empire handgunners and their commanding officer. While it’s not exactly a realistic depiction of standard gameplay, it does provide quite the spectacle. An overwhelming focus on puns over tactics pays off in the end, in what I would have assumed was an unwinnable battle. As they put it towards the end there, it’s a good example of how positioning your forces and using them smartly – as well as spamming battle skills on an overpowered lord – can turn the tide. Would like to see some more of these – zombie dragons versus gryphon riders, perhaps? Or an endless sea of goblins versus a contingent of giants? Even if the folks over at Creative Assembly don’t do it, you can bet your last Dwarven grudge the community will. Game is out on a sadly delayed May 24. Along with the battle videos, CA have been uploading monster introductions to their YouTube channel. Do check out their last vid for something a bit more standard – featuring Chaos crushing the Empire, as they should.